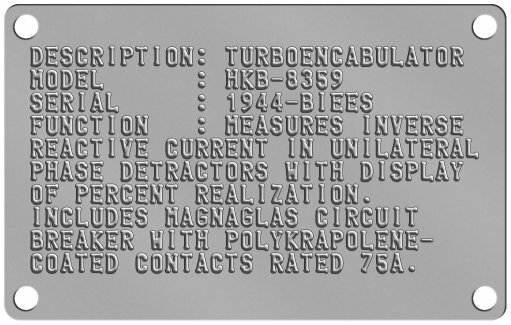 Our military spec stainless tags and plates are ideal for marking industrial equipment and material. Weather resistant and non-oxidizing, the raised embossed characters will not wear down and will remain easy to read for decades. Ideal for industries in Chemical and Petroleum, Offshore Drilling, Utilities, Power Plants, Aerospace, Railroad, Steel mills, Construction, etc. Plates can be cable-tied, riveted, bolted, or screwed directly to the equipment or containers. Our extra large nameplates with 4 bolt holes allow for 10 rows of text with 30 characters per row! Ideal for identifying large industrial equipment or providing operating and maintenance instructions. Our smaller mil-spec tags are ideal for tagging other industrial infrastructure and equipment like pipelines. Braille and Larger Embossed fonts are available. Customize to Buy your Industrial Nameplates now! All orders are shipped within 1 business day and are usually delivered within 1 week (in North America). If you need any assistance creating or ordering your Industrial Nameplates please contact us directly, we are here to help!